I was contacted by SKM, a firm of accountants with offices in the centre of Preston and asked to restore all 15 of the sash windows in their offices. As is usually the case with windows, it was only the lower section of the frame which had deteriorated so rather than replace the entire window it was possible to repair the damage. This usually works out considerably cheaper and in the case of original windows helps to preserve the character of the building, often a consideration in conservation areas as in this case. All replacement sections were treated with either a pre-vac process or preservative to increase their resistance to decay. The job was completed in two weeks and the client was very pleased with the result and cost savings. 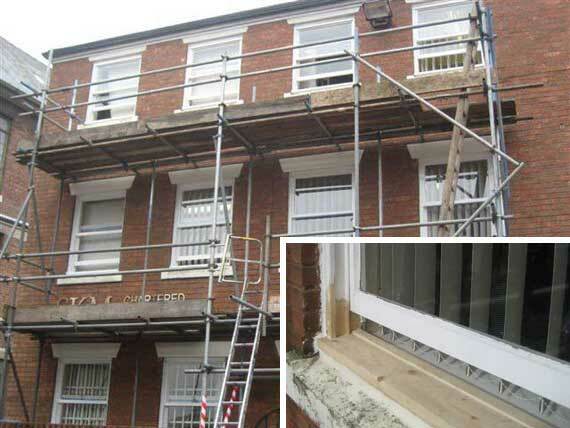 I also repair broken sash windows replacing weights, renewing sash cords, repairing damage to beading, etc. In fact, everything needed to restore the sash window and allow it to function correctly.